Even though the seasons are coming to a close, many Red Sox prospects continue to see playing time. Henry Ramos (pictured) had a strong week, while Nate Reed continues to impress in Mexico. This week's roundup covers Dec. 23-29. The playoffs started on Friday, and no Red Sox players appeared in any of the games over the weekend. Licey and Gigantes are each one win away from advancing to the finals. Just like that, Alex Castellanos is gone. The Rangers claimed the 27-year-old outfielder off of waivers Monday. The move comes about a week and a half after the Red Sox designated him for assignment when they re-added Mike Napoli to the 40-man roster. Castellanos' stay in the system was a short one. The Sox acquired him from the Dodgers in exchange for outfielder Jeremy Hazelbaker in October, so he never played a game in the Sox system. Castellanos hit .257 with a .347 OBP and .468 slugging mark in Triple-A this year, and he owns a .171/.186/.390 slash line in 24 major league games with the Dodgers the last two years. It’s the home stretch for most of the winter leagues, including down in the Dominican, where a handful of Red Sox minor leaguers wrapped up their regular season Sunday. This week’s roundup covers Dec. 16-22. In two innings of relief, Rubby De La Rosa allowed two runs on three hits. He did not collect any strikeouts or walks. At the plate, Keury De La Cruz had one hit in each of his three games during a 3-for-8 effort. Two of his hits were doubles. Alex Hassan had a similar 2-for-6, two-walk showing in a pair of contests. Aneury Tavarez had one hit in seven at-bats. For Alex's list, head over to Baseball America's website. The Red Sox have acquired utility infielder Jonathan Herrera from the Colorado Rockies in exchange for left-hander Franklin Morales and reliever Chris Martin, according to media reports. Herrera, 29, has spent his entire 12-year professional career in the Rockies organization and spent the last five at the major league level. Herrera has primarily played as a utility infielder, logging over 100 games at both shortstop and second base during his five years in Colorado. Herrera, who has also seen time at third base, is widely regarded in the game as an above-average fielder. In over 900 major league at-bats, Herrera has shown little with the bat posting a .658 career OPS. However, in 196 at-bats in 2013 Herrera posted career highs in batting average, .292, and OPS, .701. 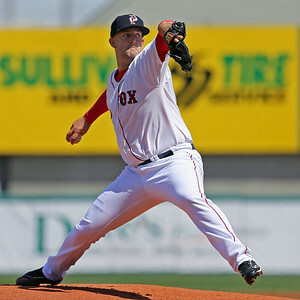 Martin, 27, is a 6'7" right-hander who split time in 2013 between Double-A Portland and Triple-A Pawtucket. In 72 innings between the two levels he posted strong numbers including a 1.05 WHIP and a 4.63 strikeout-to-walk ratio. Morales, also 27, began his career with the Rockies and has spent the last three seasons in Boston where he was shuttled between the rotation and the bullpen. After posting solid numbers in 2012, the left-hander struggled with injuries and ineffectiveness in 2013. While inconsistent as a starter, Morales has repeatedly demonstrated the ability to get left-handers out. Photo Credit: Jonathan Herrera by Doug Pensinger. Boles has been a manager in the Boston system since 2008, joining the Red Sox after stints coaching in the Marlins, Royals and Twins organizations. 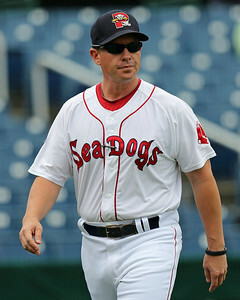 After managing the Greenville Drive from 2008-2009, and the Salem Red Sox in 2010, Boles has spent the last three years leading the Portland Sea Dogs. The 38-year-old coach has a career 797-786 record over 13 seasons, and won an Arizona League title with the Royals in 2003. He will replace Gary DiSarcina, who left to become the third base coach for the Los Angeles Angels. Sauveur will return for his seventh season with the PawSox, and he will be in charge of the highly-touted pitching staff slated to open next season in Pawtucket. Joppie returns for a second season as hitting coach, while Jochim is back for his fifth season as PawSox trainer. Crabbe, who managed the Spinners last season, will join the PawSox staff, though his role is currently unidentified. The Red Sox announced on Tuesday that they have acquired reliever Shunsuke Watanabe from the Chiba Lotte Mariners of Japan's Nippon Professional Baseball League (NPB). The 37-year-old right-hander with the submarine delivery did not receive a major league spring training invite, so he will report to minor league spring training where he will work as a reliever. Watanabe worked primarily as a starter in Japan, where he compiled an 87-82 record with a 3.65 ERA. He does not miss many bats, striking out only 4.8 batters per nine innings in his career, but he has also showed good control as he has walked only 2.2 batters per nine. Watanabe's submarine delivery received national attention during his appearances in the World Baseball Classic, where he pitched for Japan in 2006 and 2009. As you can see in this photo from the Washington Post, Watanabe's hand is almost scraping the ground when he releases the ball. The Red Sox have signed right-handed reliever Dayan Diaz and third baseman Carlos Rivero to minor league contracts, reports Matt Eddy of Baseball America. Going in the other direction is Mark Hamilton who has signed a minor league deal with the Atlanta Braves after spending the 2013 season with Pawtucket. Diaz, 24, has a live arm that has been held back by injuries. Originally signed out of Colombia by the Astros, the 5-foot-10 righty debuted in the Venezuelan Summer League in 2006. According to Brett Taylor of the Cubs website Bleacher Nation, Diaz was set to come stateside in 2009, but an elbow injury necessitated Tommy John surgery. He missed all of that season and returned to pitch only twice in 2010. He opened eyes in 2011 and 2012, striking out 134 in 108 1/3 innings between Short Season-A Tri-City and Low A Lexington, compiling a 1.91 ERA but issuing 39 walks. With many off-season leagues winding down their action, Red Sox prospects saw a lot of late season action around the world this week. Alex Hassan went 4 for 14 with a solo home run, three walks and two runs scored in five games. Aneury Tavarez appeared in just two games, going 0 for 8. Rafael Perez tossed 2 1/3 scoreless innings of relief, allowing just one walk across three relief appearances. Rubby De La Rosa made his debut on December 10 against Este, allowing an unearned run on two hits and a walk in 2/3 innings pitched. Terry Doyle (pictured) had a fantastic two start week. He picked up two wins, hurling 13 innings, allowing just one run on 10 hits and eight walks, punching out eight. Macro Duarte appeared in two games, tossing 3 1/3 innings, allowing two runs on four hits while striking out two. Nate Reed made one start this week, hurling 4 1/3 innings, allowing one run on five hits and a walk, striking out six. Jesus Loya was 0 for 5 with a run scored and a stolen base in limited action. The Red Sox designated Alex Castellanos for assignment today after making the signing of first baseman Mike Napoli official. Castellanos was acquired from the Los Angeles Dodgers in October in exchange for outfielder Jeremy Hazelbaker and cash considerations. This season, while playing for the Triple-A Albuquerque Isotopes, he hit .257/.347/.468, but those numbers were inflated by playing in the hitter-friendly Pacific Coast League. He also got a short cup of coffee with the Dodgers, but only hit .167/.167/.389 in eight games. Over the course of his professional career, Castellanos has played every position in the field with the exception of catcher and pitcher. His best position is in a corner outfield spot, but he has shown the ability to fill in at either second base or third base. Due to that type of versatility, he was expected to play a super utility role wherever he ended up being assigned in 2014. 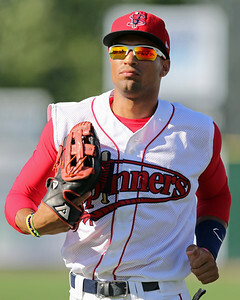 Almanzar, 23, spent the entire 2013 campaign with Double-A Portland. He got off to a fast start, hitting .319/.367/.560 in April and earning recognition as an Eastern League All-Star. However, he tailed off in the second half and finished with a .268/.328/.432 line. Despite the slow finish, a second straight solid season helped to restore some of his prospect status. Originally signed to a $1.5 million bonus in 2007 out of the Dominican Republic, Almanzar struggled for years with both on-field difficulties and attitude issues. "New Stars for Young Stars" is back for a ninth year, the Jimmy Fund Council of Greater Boston announced, and the annual autograph-signing event for a good cause has no shortage of top prospects scheduled to be in attendance. The tentative lineup includes: SoxProspects.com Offensive Player of the Year Mookie Betts, Blake Swihart, Drake Britton and Rubby De La Rosa. Gordon Edes of ESPNBoston.com reports new Red Sox catcher A.J. Pierzynski is also expected to be there. More players will likely be added as the event draws closer to its Jan. 11 date (11 a.m.-1:30 p.m.) at Jillian's Boston on Ipswich Street. As a majority of the winter leagues are winding down, many Red Sox prospects are still seeing significant playing time in their respective leagues. A handful of players had big weeks, led by an Australian who also earned a place on an All-Star team. This week's roundup covers December 2-8. Alex Hassan went only 3 for 15 this week, but one of the hits was a game-winning single in the eighth inning off of former teammate Brock Huntzinger. Appearing in his first game since November 16, Keury De La Cruz went 0 for 4 with a strikeout. Newcomer Aneury Tavarez joined the league this week, going 1 for 6 with a double for the Estrellas de Oriente. Seeing his first action since the end of the 2013 season, Nate Reed pitched three shutout innings while striking out three. Jesus Loya was held hitless this week, going 0 for 7 with a walk. A series of injuries underlies Boston's decision yesterday not to tender contracts to outfielder Ryan Kalish (pictured) and reliever Andrew Bailey for the 2014 season. While both arrived in Boston carrying exceptional talent and great expectations - Kalish after a sterling minor league career and Bailey after a blockbuster trade - neither have been able to overcome a series of frustrating setbacks that have made the two unable to capitalize on their outstanding tools. Kalish, 25, was the top prospect in the Boston system who has seen his career sidetracked. Drafted in the ninth round of the 2006 draft out of Red Bank (NJ) Catholic High School, he impressed from the start, earning all-star recognition playing for Short-Season A Lowell in 2007, his first full pro season. A broken hamate bone in his right wrist ended that 2007 season early and delayed the start of his 2008. 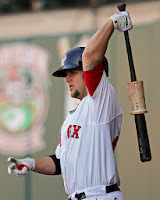 Fully healthy in 2009, Kalish was named the Red Sox Minor League Player of the Year and the SoxProspects.com Breakout Player of the Year, compiling a .279/.364/.457 line with 18 home runs and 21 stolen bases between High A Salem and Double-A Portland. He followed that by made his major league debut in 2010, appearing in 53 games and hitting .252/305/.405. After that promising debut, however, it has been a series of disappointments for the young outfielder. All of the offseason leagues are well into their season, but that doesn't prohibit movement from the personnel. Alex Hassan, J.C. Linares and Stefan Welch are all new to their respective leagues relative to their teammates. This week’s roundup covers Nov. 25-Dec. 1. Hassan, the only Sox player to see action, got into three games during his second week in the DWL. He finished 3 for 11 with a double, a walk and six strikeouts. After seeing single at-bats in three games, Jesus Loya got back-to-back starts and made the most of it. He went 4 for 8 with a homer and four RBI. Linares played in a quartet of contests during his first week in the VWL, turning in a 4-for-15 effort with a double and three RBI. There may not be much going on, but Chris, Matt, and Jon still got up from their Thanksgiving naps to answer some reader questions. Among the subjects on tap were how contracts are calculated against the Competitive Balance Tax, how the Sox plan to use Cuban pitcher Dalier Hinojosa, what to make of Brian Johnson's 2013 season, and a lightning round of quick player questions. Inspired by a listener email, we debuted a new regular segment, tentatively called "Where Are They Now? ", where we check in on former Sox prospects. Today, we look back at the prospects involved in the Adrian Gonzalez trade. With the Arizona Fall League wrapped up, attention turned to other winter leagues around the world. This week’s roundup covers Nov. 18-24. Allen Webster picked up his first victory of the offseason, hurling five innings, allowing two runs on five hits and two walks, punching out seven against Aguilas on Tuesday. Bryce Brentz was 0 for 2 in his lone game of the week. JC Linares appeared in two contests, going 1 for 5 with a run scored. 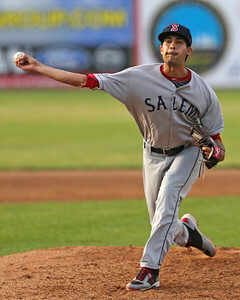 Free agent Rafael Perez continued to pitch well, throwing 1 1/3 scoreless innings of relief across two appearances. Perez has allowed just one earned run in 9 1/3 innings. The Red Sox have traded left-handed pitcher Luis Ortega (pictured) to the Milwaukee Brewers in exchange for right-handed reliever Burke Badenhop. Badenhop, 30, has appeared in 280 games over parts of six seasons with the Marlins, Rays, and Brewers. Consistency has been the calling card of the 6-foot-5 righty since moving to the bullpen full-time in 2010. In each of the last four seasons, he has posted an ERA between 3.03 and 4.10 while throwing between 63 and 68 innings each year. In both 2012 and 2013, Badenhop struck out 42, walked 12, and allowed six home runs in 62 1/3 innings, allowing one fewer hit (62) in the latter year. Before Wednesday's deadline to place players on the 40-man roster to protect them from the Rule 5 draft on December 12, the Red Sox have made three additions: third baseman Garin Cecchini, outfielder Bryce Brentz, and right-hander Anthony Ranaudo. Following these moves, Boston has one open slot remaining on its 40-man roster. 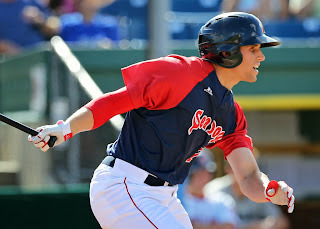 Cecchini is coming off a breakout season in which he hit .322/.443/.471 across two levels and rose to the number three prospect in the Boston system on SoxProspects.com. 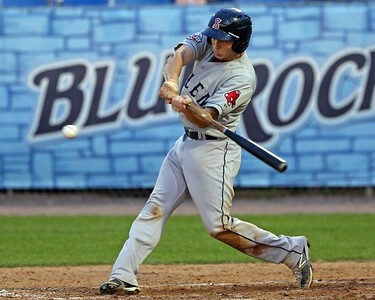 A fourth-round pick in the 2010 draft, Cecchini has been an All-Star in each of the last three seasons, earning honors in the New York-Penn League in 2011, South Atlantic League in 2012, and in the Carolina League in 2013. He was promoted to Double-A Portland on June 21, and selected to play in the Futures Game during the All-Star break. 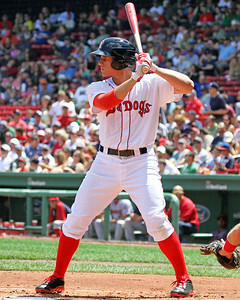 Cecchini projects to begin 2014 as the starting third baseman at Triple-A Pawtucket. Look for Boston to make at least three roster moves on Wednesday to protect prospects from selection by other teams in the 2013 Rule 5 Draft. Eligible players must be added to their teams’ respective 40-man rosters by close-of-business on Nov. 20 in order to be protected from selection in the Rule 5 Draft, which is scheduled to take place on Dec. 12, the final day of the winter meetings. If selected, the player must stick on the drafting team’s 25-man roster for the entire 2014 season, or must be offered back to the Red Sox. Right as the Roberto Clemente League is getting into full gear, the Arizona Fall League is hitting the home stretch of its regular season. With four games to go — one each Monday through Thursday — the Surprise Saguaros could clinch the division as soon as Tuesday afternoon. This week’s roundup covers Nov. 4-10. A 3-3 week for the Saguaros left the team with a 2.5-game lead over the Glendale Desert Dogs, its magic number in the AFL West down to three. Travis Shaw put together a huge week, going 7 for 13 with five runs scored and two driven in. He walked five times — at least once in each of his four games — while scoring as many runs. His fall slash line is up to .352/.446/.722. The World Series trophy in hand, the Red Sox can look forward to 2014 with confidence on a number of fronts. First and foremost, a significant portion of the core of the 2013 championship team is under contract and expected to return. Even a few of the recently filed free agents may return. On top of that, the upper levels of the farm system are stacked with talent, whether it be as potential impact starters, role players, emergency depth, or potential September call-ups. In fact, “Baseball America” recently ranked Boston as the No. 1 system in the majors in terms of prospects poised to deliver short-term value. (And frankly, the Astros weren't that close at No. 2). Today, we wrap up our 2013 Top 40 Season in Review with who else but Boston's budding Aruban superstar. You can check out the other entries in this year’s series here. Xander Bogaerts: Top prospect, shortstop, and ... bunter? 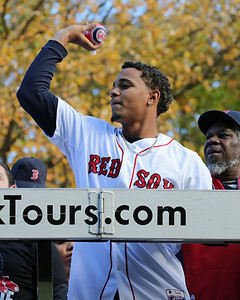 Pre-2013: Entering this year, Bogaerts was already among the game’s brightest young prospects, considered unanimously to be one of the top 20 prospects in the game after three seasons as a pro. The Aruban shortstop signed with the Red Sox in August 2009 along with his twin brother, Jair, and received a $510,000 signing bonus. 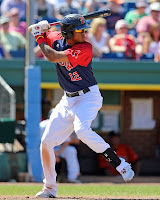 Debuting the following summer in the Dominican Summer League, he showed the talent that had first excited Red Sox scouts after seeing him on the backfields of Aruba, hitting .314/.396/.423 with three home runs and seven doubles over 239 at-bats. 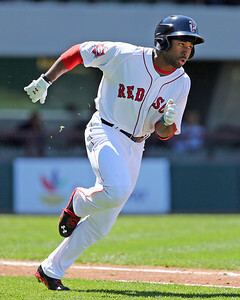 SoxProspects.com readers voted him the system’s Rookie of the Year, and the Red Sox tabbed him as Latin Program Player of the Year. Top 40 Season in Review: Jackie Bradley, Jr.
Pre-2013: Bradley was projected to be a high first-round draft pick coming out of South Carolina in 2011 following a year in which he earned Most Outstanding Player honors in the College World Series, but a torn ligament in his wrist caused him to slump to a .259/.361/.468 line that season, dropping his draft stock. Fortunately for the Red Sox, Bradley dropped to the supplemental first round, where the team drafted him with the 40th pick overall. The outfielder signed for a $1.1 million bonus that August, and appeared in 10 games between Lowell and Greenville that season to get a taste of pro ball. The Puerto Rican Winter League began action this week as an increasing amount of Red Sox prospects made impacts in leagues around the globe. Additionally, two top prospects were highlighted in Saturday's Arizona Fall League All-Star contest. This week's roundup covers the period of October 28-November 3. The Surprise Saguaros went 3-1-1 this week, and hold a three and a half game lead in the AFL Western Division. Mookie Betts appeared in two games this week, going 1 for 9 with a run scored and three stolen bases. Betts also appeared in the AFL All-Star game, starting at second base, going 0 for 1 with a walk and a run scored. 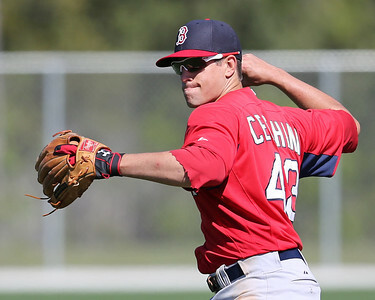 Fellow infielder Garin Cecchini (pictured) has cooled off as of late, going 0 for 7 with two walks in two games this week. Cecchini joined Betts in the AFL All-Star game, going 1 for 2 with a solo home run in the eighth inning. The West Stars defeated the East Stars, 9-2. 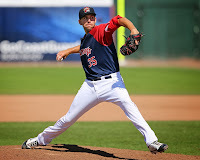 Pre-2013: The Red Sox selected California high schooler Owens in the supplemental first round (36th overall) in the 2011 Draft as a tall, projectable left-hander with a high ceiling. He signed in mid-August at the deadline, with $1.55 million enough to lure him away from his commitment to the University of Miami. Although he signed too late to make his pro debut that season, he participated in the Fall Instructional League. 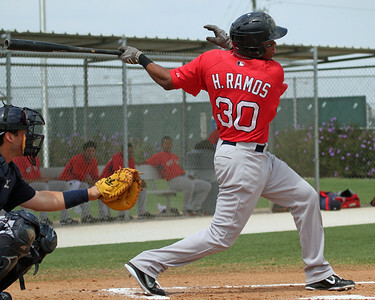 Pre-2013: After an extremely impressive performance in the Cape Cod League followed up by a dominant junior season at the University of Connecticut, the Red Sox made Barnes the 19th overall selection in the 2011 draft. The 6-foot-4 right-hander did not sign until the August 15 deadline, so Barnes’ professional debut had to wait until the following spring. Barnes was initially assigned to the Greenville Drive, but the Low A South Atlantic League proved no match for him. In five starts at that level, Barnes was charged with only one run, and even that was an inherited runner. To go with the 0.34 ERA over 26 2/3 innings, he also compiled a 0.60 WHIP, striking out 42 while walking only four. 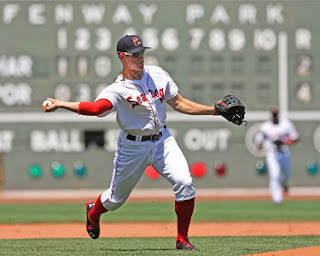 The Red Sox were convinced that Barnes had sufficiently adjusted to pro ball, and he was promoted to Salem on April 29. Pre-2013: After a dominant sophomore campaign in 2009 at Louisiana State University (LSU), many projected Ranaudo to be a top-five pick in the 2010 draft. After battling through injuries and ineffectiveness in his junior season, Ranaudo fell to the 39th pick in the draft, where the Red Sox selected him with the compensation pick they received for Billy Wagner. Ranaudo agreed to a $2,550,000 deal minutes before the signing deadline, so he did not make his first professional appearance until 2011. Ranaudo opened the 2011 season in Greenville, and he made only 10 starts with the Drive, only allowing runs in half of those, before getting bumped up to Salem. Ranaudo pitched well after his promotion, allowing seven runs in 23 innings over his first four starts, but he appeared to tire as the summer went on. In his next 35 2/3 innings over 7 starts, Ranaudo allowed 26 earned runs and struck out only 24 batters, a disappointing number for a pitcher who finished third in the nation in strikeouts during his sophomore season at LSU. He bounced back from this rough stretch to end the season strong, giving him something to build on as he entered 2012. Pre-2013: The starting shortstop at McMichael (NC) High School, Allen Webster caught the eye of veteran scout Lon Joyce when he pitched an inning of mop-up duty in a blowout. Impressed, Joyce got the Dodgers to take a flier on Webster in the 18th round of the 2008 draft. 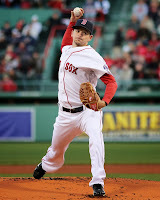 He signed quickly but worked his way up the ladder slowly, spending that season and all of 2009 in Rookie ball making the transition to pitching full-time. He made a solid debut in full-season ball in 2010 with Great Lakes of the Midwest League, striking out 114 batters in 131 1/3 innings, but also walking 53, showing the control issues with which he still struggles. Webster established himself as a prospect in 2011, at 21 in his third year as a full-time pitcher, starting the season with a short, successful stint in the notoriously hitter-friendly environs of the California League. He posted a 2.33 ERA through nine starts and allowed less than a hit per inning while striking out 62 in 54 innings. He was challenged with a promotion to Double-A Chattanooga in late May. While he posted a 5.05 ERA at the level, he struck out 73 in 91 innings against the more mature competition, earning him recognition as the number 95 prospect on the Baseball America Top 100. Pre-2013: The 2011 draft was a strong one for the Red Sox; their first four picks all currently rank in the top eight in the SoxProspects.com rankings. This includes Swihart, whom the Red Sox selected with the 26th overall pick despite his strong commitment to the University of Texas. It took a $2.5 million bonus, the third-highest ever given out by the Red Sox to that point, to convince him to pass up college. He was drafted as a catcher despite being so athletic that his New Mexico high school team often played him all over the field, including at shortstop. That year he got only a small taste of professional baseball, playing in just two games for the GCL Red Sox after signing. Season in Review: The Red Sox, having their highest draft choice since selecting Trot Nixon in 1993, selected Ball with the seventh-overall pick of the 2013 draft. One of the best two-way players in the country, Ball gained attention for his performance on the mound (6-0, 0.76 ERA, 93 strikeouts, 13 walks, 46 IP) for New Castle Chrysler High School in Indiana. Previously committed to attend the University of Texas, Ball signed with Boston for $2.75 million on June 19, but fans eager for him to debut had to wait more than another month. The 6-foot-6 left-hander finally made his professional debut on July 29 in the GCL, and by the end of the season had appeared in just five regular season games and pitched seven innings, plus a scoreless two-inning start in the playoffs. Given his two-month layoff between the end of the high school season and his pro debut, his struggles—he allowed runs to score in four of his five regular season starts, and never went longer than two innings due to his pitch count—are easier to understand. The Fall/Winter leagues aren’t quite in full swing, with Puerto Rica, Australia and Colombia set to get underway early next month, but there’s been no shortage of notable performances from the Red Sox farm system. This week’s roundup covers Oct. 21-27. It was another successful week for the Surprise Saguaros, who again went 4-2 and sit atop the AFL West. The Sox infielders with Surprise contributed to that success to varying degrees. Second baseman Mookie Betts went 2-for-13 with a double and two walks, but finished his week on a 0 for 9 skid. Third baseman Garin Cecchini put together a 5-for-18 effort with zero extra-base hits. First baseman Travis Shaw had more strikeouts (four) than hits (three, two doubles) in his 13 at-bats, while Derrik Gibson went 0 for 5. He drew three walks but is still looking for his first AFL hit.